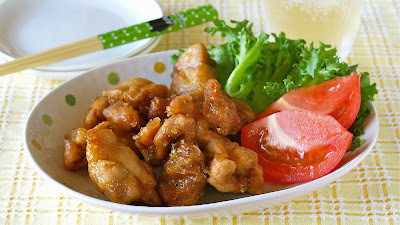 Karaage (Japanese Fried Chicken) is the best party recipe favored by most people! 1. Remove skin of the chicken. Make incisions to flatten chicken. Then slice. 2. Mix the seasonings, place the chicken, and marinate for 15 minutes or more. 3. Mix the batter in one bowl, beat 1 egg in another bowl. 4. Dust the chicken with batter, dip in beaten egg, then dust again with batter. 5. Pour about 2cm/1in oil into a frying pan. Put on medium (the temperature is at about 180C/350F), cover, and cook for 3 minutes. Open the lid, flip them over, cover again and cook for another 3 minutes. Then open the lid, put on high and cook for 1 minute until crisp golden. 6. Drain well, place on a dish, serve with some ketchup, mustard, and lemon juice if preferred. Crunchy outside, creamy inside. The cream is slightly sweet with juicy corn kernels. People in Japan love these~ kids love them so do the adults. This vegan version tastes really good. Those who are not vegan would also enjoy this recipe for sure!!! 1. Mix soy milk, rice flour, salt, and pepper in a bowl or a spouted measuring cup. 2. Heat olive oil in a pot, then cook chopped onion on medium low until tender. 3. Add 1 in 2, then cook on medium low, stirring constantly, until starting to thicken. 4. Spread on a tray, let cool, cover with plastic wrap, then cool it completely in the fridge for 2 hours. 5. Divide it into 16 portions, form each into a cylinder shape, dip in rice flour water mixture, then coat with rice Panko bread crumbs. 6. Deep fry in oil at 180C until golden brown. Best eaten just made. 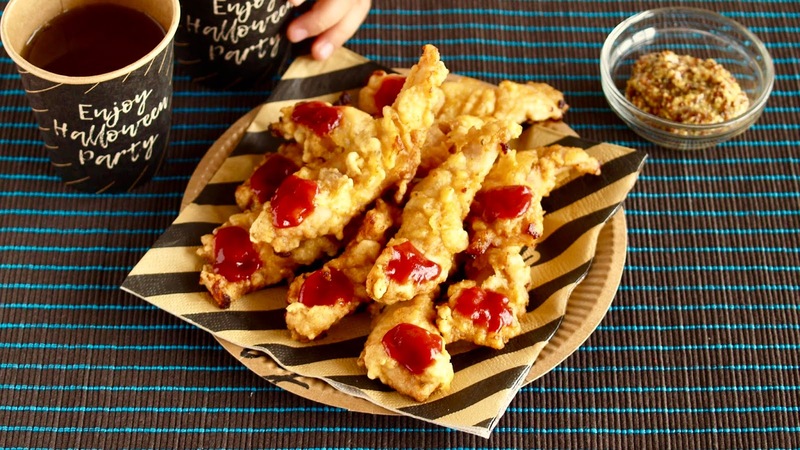 You can serve with Tonkatsu sauce or tomato ketchup if you like but without any sauce is good enough. Note: Don't blame me, I tried to make it with the ingredients available in Japan. 1. Peel and cut potatoes into medium chunks and place them in a pot with chicken breast. Add water until cover, then boil them until soft for about 20 minutes. Drain and mash the potatoes (in a pot) while hot. Add milk, butter, and consomme, then mix well. Shred the chicken with your fingers. 2. Heat cooking oil in a pot, add chopped onion, then cook until tender. Add the shredded chicken and finely chopped fresh parsley, then season with salt and pepper. 3. Put the pot with the potato mixture on low heat, add bread flour, then knead until combined. Leave to cool until you can handle it, then divide it into 10 portions. 4. Grease your hands with cooking oil, flatten the dough, place the filling in the center, then wrap the dough into a pear shape. 5. Coat with bread flour, beaten egg, then bread crumbs. 6. Deep fry in oil at 170C (338F) for about 6 minutes until golden. "Okaki" is rice crackers and "Age" means deep fried. Okakiage appears on Manga: "Shokugeki no Soma (Food Wars)". Cod fish was used in its episode; however, I used chicken which is familiar to everyone. 1. Remove the skin of chicken if you don't like, cut into bite-size pieces, then season with salt. 2. Remove the peanuts from Kaki no tane. Place them in a Ziploc bag and break into small pieces. *You can use a food processor if you have. 3. Place it in a flat container and coat the chicken. Deep fry them in oil at 170C (338F) for 5~6 minutes, until they float up to the surface. 4. Drain well and serve on a dish with lemon wedges. Lemon is a must! It makes the chicken very tasty and delicious. Of course ketchup goes good, too~. 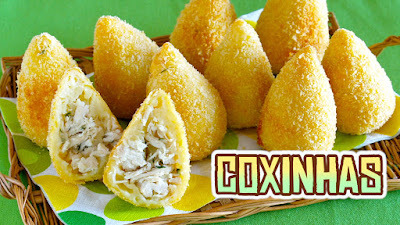 Very rich and tasty Korokke (Croquettes)! 2. While still hot, add diced avocado. By heating avocado, you can avoid it from chaining color. 4. Flatten the mixture and divide it into 6 equal portions. Place some pizza cheese in the center and flatten each portion into an oval-shaped patty. 5. Coat each patty with flour, dip in beaten egg, and coat with Panko. 6. Deep fry in oil at 170C(338F) until golden brown. 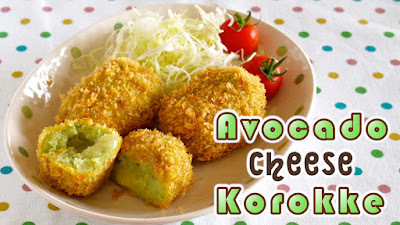 Serve with tomato ketchup or mayonnaise if desired. Best eaten while still hot, or avocado can become soggy. Wavy tray catches excess oil, so the Karaage will turn out crisp. The silicon paper will avoid Karaage from sticking. 1. Cut the chicken into 8 pieces. Season with A and marinate for 15 minutes. *This process will make the chicken tender. 2. Put Katakuriko (potato starch) or flour in a plastic bag. Remove excess seasonings from the chicken using paper towel (to make it crisp), then add into the plastic bag. Shake and coat the chicken with the starch. 3. Discard excess starch if any, add cooking oil, then coat until no longer powdery. 4. Place the wavy sheet on the tray and place the chicken pieces. 5. Place the tray on a microwavable dish. Microwave at 500w for 6 minutes (or 600w for 5 minutes). 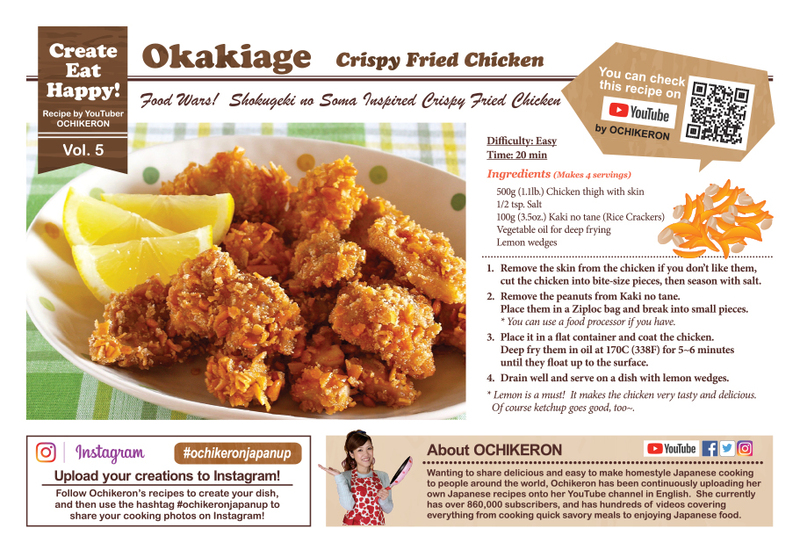 - Cookper Microwave Karaage Tray comes with 6 wavy silicon sheets. Each sheet is one-time use. - You can enjoy your favorite flavor by changing the seasonings!!! - You can also use this product to reheat deep-fried food. 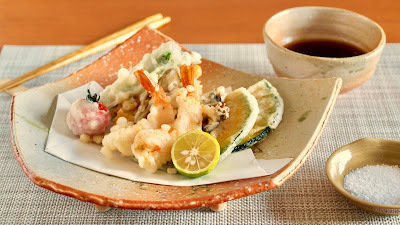 Ebi Furai (Deep Fried Prawn) is Japanese-invented Western-style deep fried dish, such as Tonkatsu. 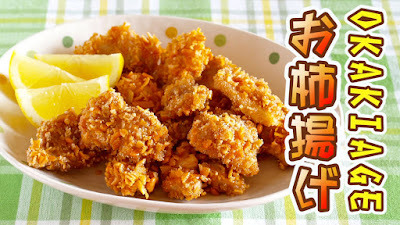 It is a very popular deep fried main dish in Japan as well as Japanese restaurants worldwide. 1. Wash, peel (leave the tails on) and devein the prawns. Make 4-5 incisions (about 1/3 depth) in the stomach side to straighten them. Cut the tip of the tail off and remove the water inside to avoid splatters when deep frying. Season with salt and pepper. 2. 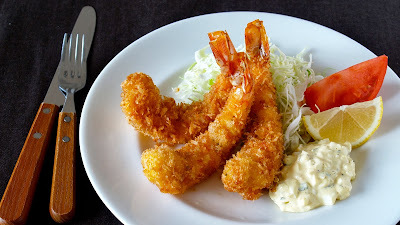 Flour the prawn lightly, dip in beaten egg, then coat with Panko. Use one hand for coating flour and Panko, and use the other to dip in egg to keep one of your hands dry. 3. Deep fry in oil at 170C (340F) for 2-3 minutes until cooked through and golden brown. Remove from the oil and drain. 4. Mix Tartar Sauce ingredients well. Serve along with Ebi Furai, with shredded cabbage and tomatoes. 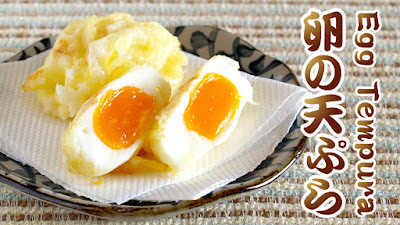 Eat with lemon juice, tartar sauce and/or Tonkatsu sauce. Any way you prefer! *You can coat more than 6 prawns with this amount of batter. Make more if needed! 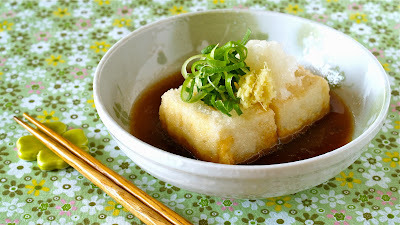 Agedashi Tofu or Agedashi Dofu is a very popular traditional Japanese appetizer dish. "Age" means "deep fried" and "Dashi" means "broth". Thus: deep fried Tofu steeped in Dashi-based sauce. 1. Cut Tofu into 6 pieces. Drain on a strainer for 5 minutes. Then you can also remove excess water with paper towel if necessary. 2. Heat the vegetable oil for deep frying to 170-180C (340-350F). 3. Coat Tofu with Katakuriko (potato starch). Drop into the oil immediately after coating. Deep fry until puffed and lightly golden (about 2 min). Then drain well. 4. Bring Dashi Sauce to a boil. 5. 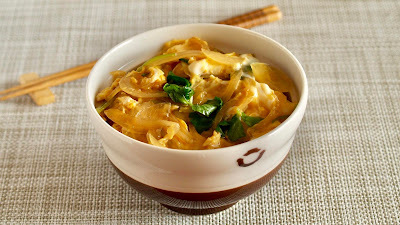 Place the Tofu in a serving bowl, garnish with some toppings of your choice: Daikon Oroshi, chopped green onion, and grated ginger, then pour the Dashi Sauce over it. You can of course use "Kinugoshidofu (silken Tofu)" but remember it is very soft and fragile.